Prior to enlisting he was living at 110 Yarrow Street, Invercargill and working as a carpenter for P.C. Lee, builders, Invercargill. He joined up in Invercargill 12 August 1914 with the Otago Mounted Rifles, machine gun section, with the rank of Trooper. 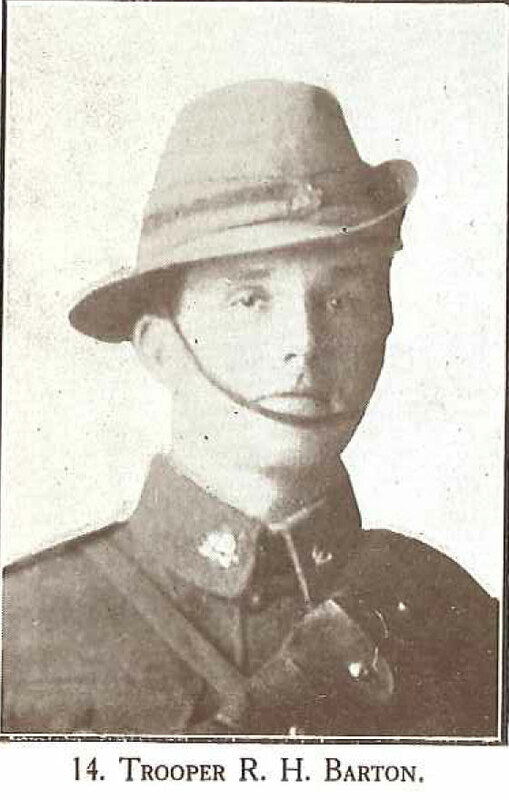 His enlistment forms state he had previous military service with the Canterbury Yeomanry for 3 years and had served in the NZ Ambulance Service for 1 year. He is described as being aged 23, single, of dark complexion, chest 34 inches, 160 lbs in weight, 5 foot 8 ½ inches tall, eyes brown, hair brown and having artificial top teeth and good teeth below. Richard served in NZ from 12 August to 14 October 1914 and embarked from Port Chalmers 16 October aboard the Hawkes Bay for Suez, Egypt arriving 4 December 1914. In October 1915, his parents had a most unfortunate experience. A swag was deposited at the door reading “Deceased R.H. Barton 9/548”. This was the first and only intimation that anything had happened to their son. The parcel contained a few personal belongings and letters from his mother and sisters. Considerable indignation was expressed by friends of the bereaved family when they heard of the tragic happening. Richard had been killed in action at the H2 outpost, Walker’s Ridge 16 June 1915 and was buried 17 June by Chaplain Bush King in the No.2 Outpost Cemetery. Richard’s 1914-1915 Star, British War Medal and Victory Medal were sent to his father along with a plaque and scroll after the war. Richard's name is on as "Burt" on the family headstone in Timaru Cemetery.